San Miniato is a picturesque town in the province of Pisa, perched on a hill along the river Arno, famous for white truffles and leather manufacturing. The first human settlements in the area date back to the Etruscan period, as many archaeological findings reveal; soon after the town fell under the Roman control. The first documents, however, date back to the VIII century AD, when some Lombards - as stated by a document of 713 and still preserved in the Archives of Archbishop of Lucca - built there a church dedicated to San Miniato. Due to its German origin, the city is also known as San Miniato al Tedesco (San Miniato to the German). Otto I of Saxony made it one of the centers of the Imperial administration, while Frederick II Swabian built here a castle. After the decline of the Swabian dynasty, San Miniato became a free town and, later, was submitted to Florence. Napoleone Bonaparte went to San Miniato twice: the first time in order to receive the certificate of nobility, a prerequisite to access to the Military Academy, and, the second time, during the Italian Campaign, to visit his uncle, Philip Buonaparte. During the Second World War, the German troops blew up both the castle of Frederick II and the Medieval quarters, promptly rebuilt in 1957. - the Cathedral, dedicated to St. Maria Assunta and St. Genesio martyr, dating back to the first half of the XIII century. Closed in 1378 and converted into an armory, it was reopened only a century later, after being renovated. The red brick façade with projecting parts, has three Renaissance style portal doors and a rose window. The Latin cross interior has three naves, in Baroque style. It is rich in many valuable works of art, such as the altar piece by Aurelio Lomi and the octagonal font by Ghibellimo Guarnieri. In 1944 a tragic US bombing killed more than 50 people. - St. Francis Convent, dating back to 1211, is a big complex resulting by renovations and additions over the centuries. We signal the fine carved wooden choir, on the back of the main altar, by Giuliano di Baccio d'Agnolo, and the painting of the Last Supper of St. Francis and St. Claire, by Carlo Bambocci, in the refectory. 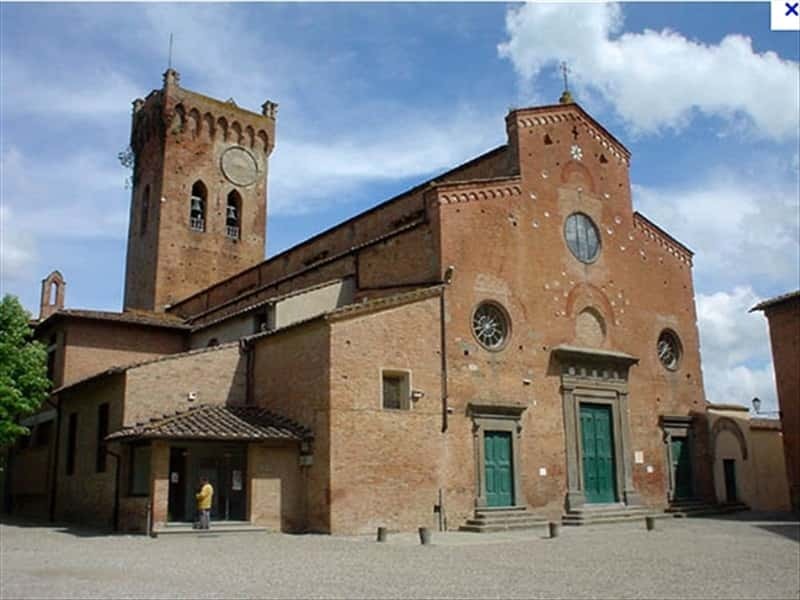 - the Church of the Saints Jacopo and Lucia (also called of San Domenico), dating back to the XI century. The convent was completed only in 1660. The façade dates back to the last years of the XV century. Inside it is possible to admire the sepulchral monument by Giovanni Chiellini, a beautiful polychrome majolica by Della Robbia workshop and a painting of Our Lady with Child and Saints by Domenico Michelino. - the Church of St. Martino, built in the XIV century near the Pieve Church of San Martino, belonged to the Augustinian nuns until the XVIII century. It has brick façade with monumental portal door and XVII century window. - Roffia Palace, late XVI century building in typical Tuscan Renaissance style, featuring a white façade and stone moldings adorning the windows and the door. - the Diocesan Museum, housed in the sacristy of the cathedral. This town web page has been visited 9,796 times.